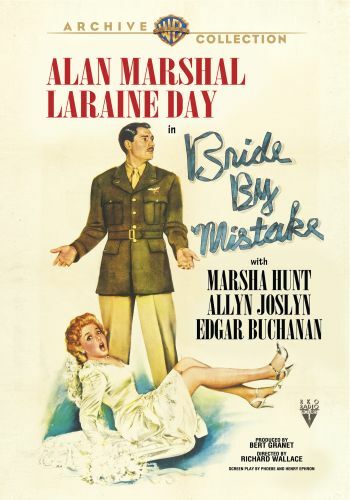 Bride by Mistake is a remake of the 1934 Miriam Hopkins vehicle The Richest Girl in the World, with a wartime angle providing topicality. Tired of being romanced by fortune hunters and being rejected by poor-but-proud suitors, fabulously wealthy Norah (Laraine Day) decides to pose as her own secretary Sylvia (Marsha Hunt), and vice versa. The plot thickens when Norah falls in love with convalescing fighter pilot Tony (Alan Marshall)-while he in turn falls for the very married Sylvia. All sorts of manic complications ensue, with Sylvia's hapless husband (Allyn Joslin) the "odd man out". RKO Radio revived Richest Girl in the World for a third time in 1954 as the Jane Russell musical The French Line.